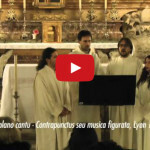 Palma Choralis Ensemble – mostly composed of the same people as the Research Group (and this is undoubtedly a nodal point for us) – carries out the very performing part of projects, always leaded together with the Research Group. The simple realization of events is not the goal, but the result of a practical research, characterized by a long-term training and rehearsals of a specific repertoire. LINE-UPS · Over the years the Ensemble has counted many different musicians from Italy and from all over the world (see the Tabula Gratulatoria), singers and players of organ, harpsichord, gamba, lute, theorbo, chitarrina à 5 cori, arpa doppia, or even the almost unknown lirone. 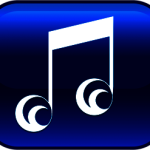 The musical directors are Marcello Mazzetti (maestro di cappella) and Livio Ticli (maestro di concerto). Palma Choralis’ concerts has taken on a wide variety of formats ranging from a Schola Cantorum, to ‘a parti reali’ ensembles or great consorts, from the medieval western and byzantine sacred music to Renaissance secular and sacred ‘concertato’ repertoire. 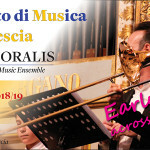 Since 2010 it has further expanded its offer by creating the new stable group Palma Choralis Duo, composed of the two directors to propose a more intimate repertoire, performing vocal and instrumental pieces from Italian Renaissance and bringing to a larger audience the preciousness of the theatrical elements exemplified by those musical sources. BRIEF HISTORY · Since 2006 Palma Choralis Ensemble has performed recently-reconstructed Divine Offices from Middle Ages of local Saints (e.g. «A Reconstructed Mass for St. Faustino and St. Giovita held at the British Library», Brescia, 2010) and has participated to ecumenical events that connected western and eastern Christian traditions («Ut unum sint. Christian chants from Byzantine and Latin traditions» and «Congaudeant Catholici», Rubiera (MO), 2009 and 2010). It has participated to most significant worships at the Diocesi of Milano, Bologna, Brescia, Como, Reggio Emilia, Palermo. In 2008 it performed as a liturgical reenactment «Te lucis ante terminum. 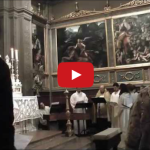 Music for the Compline Office in Reggio Emilia at the beginning of 17th cent.» and in 2009 (and then again in 2012) performed «Officium Stellae. 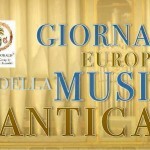 Sacred Representation in Music between Middle Ages and Renaissance»: a representation with Gregorian chant and Renaissance polyphony, realized thanks to a dramaturgical research leaded through medieval manuscripts and an actualization for the today’s public by using deuterocanonical texts (Biblical Apocrypha), costumes, architectural space and local artworks. 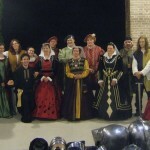 Between 2008 and 2010 the Ensemble has made concerts also during important scholarly events (e.g. E. Garin, Interpretazioni del Rinascimento (1938-1950), Cremona State Library, 2010) and governmental celebrations for national festivities («Non men d’arme e d’amor cantate vui», Government Palace of Cremona, 2010). In 2011 it collaborated with Coro della Cappella Musicale S. Francesco da Paola to perform the modern premiere of G. F. Anerio’s work «Dialogo pastorale al presepio di Nostro Signore» during the Soli Deo Gloria Festival in Reggio Emilia. 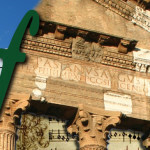 The same year it started to collaborate with some historical dance groups (particularly with La Parma Cultural Association) to carry out studies for reconstructing Renaissance spectacles and banquets. Since 2010 the Ensemble has performed at the Conditor alme siderum Festival in Cremona whose it has been also co-promoter. In 2008 it recorded some audio tracks on a CD attached to Francesco Stella and Samuel Barrett, Corpus Rhythmorum Musicum, saec. IV-IX. 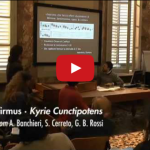 Songs in non Liturgical Sources (SISMEL, Firenze, 2008), performing musicological melodic reconstructions of 9th cent. texts.